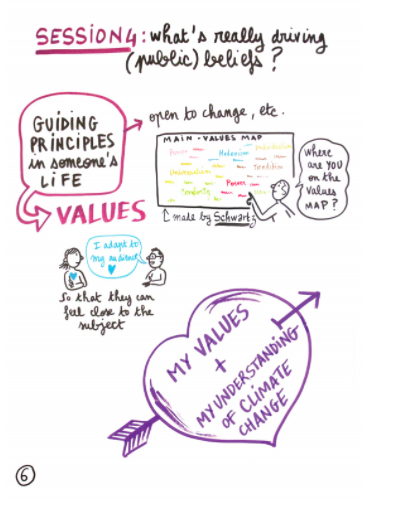 This resource takes a workshop approach with information and practical exercises that will give you knowledge of the science of climate change communication, and the confidence to apply this knowledge in practice with non-academic audiences. It is designed for all researchers across the physical, natural and social sciences. The webpages within the resource draw on a series of training workshops held with with early career researchers in Europe between 2014-2017. The workshops were created and developed by Asher Minns, Executive Director at the Tyndall Centre for Climate Change Research in partnership with Adam Corner and Chris Shaw of Climate Outreach, as part of the Helix project. To provide an introduction to the social and political context of communicating climate change, as well as specific tips and guidance for researchers (introducing the science of communicating climate change). To increase the confidence and capacity of climate change researchers to effectively engage the public (building climate change communication confidence). Provided below is a short summary of the resource. Access the full resource here. Does your audience share your perspective and level of knowledge? Your wider views? Are there different ways you can ‘frame’ your message for different audiences, based on their knowledge of the subject and interests? Getting to know what makes your audience tick will be important for building trust between you and your audience. With an issue like climate change, there will always be uncertainties. These uncertainties can be interpreted as meaning that the idea of anthropogenic climate change remains unproven. The inherent uncertainty in climate projections allows for wishful thinking. How can you start from the values the audience holds rather than the facts you want to get across? People have a range of values, and may draw on different ones at different times, but certain types of values cluster together (while others conflict with each other). In particular, ‘self-enhancing’ values like wealth, status and power (lower left quadrant of Image 1 below) conflict with ‘self-transcending’ values like altruism and concern for the welfare of others (top right quadrant of Image 1 below). Stories offer a way of building more sustainable and meaningful engagement with science because people are more used to communicating information through stories than graphs and numbers. The concept of using the narrative form for communication has become increasingly common among science communicators. The resource also provides additional reading and references.